Dennis Palys and Bob Schell are coordinating the installation of another 50 potted plants on a wetland parcel in Wonderview owned by the NWA. 2. Today, the MPOA was also notified that it will also be receiving an additional donation of 200 potted plants from “Monarch Watch” www.monarchwatch.org Volunteers will again be welcome once a planting date is scheduled. 3. The Nippersink Watershed Association has received the draft contract from the IEPA for the pending Section 319 grant, which will allow a number of water quality projects beneficial to Wonder Lake to be implemented. I will be meeting with those folks receiving grants, once I get more information from IEPA. 4. The MPOA dredging contractor has completed the dredging at White Oaks Bay and Lookout Point. 5. The MPOA continues to work with the dredging contractor to have them routinely maintain their marking of the sediment pipeline and designated crossing points. They have added buoys, lights and signage. 6. 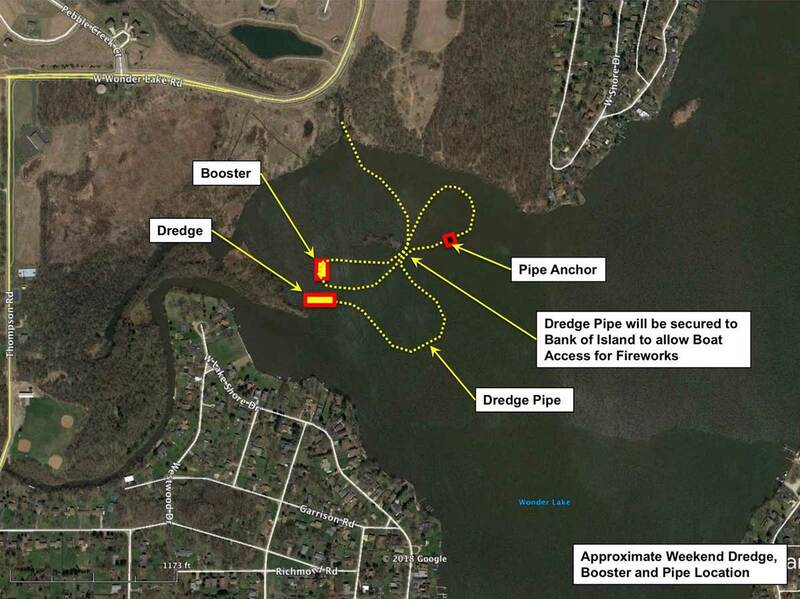 Based on the experiences of the Memorial Day weekend, it has been determined that having the dredging sediment pipeline extended across the mid-section of the lake during the summer boating season is not advisable. 7. As a result, the dredging schedule has changed. The dredge has now been moved to the south end of South Bay, where it will operate for the majority of the Summer 2016 boating season. Once completed with South Bay, the dredging schedule will be updated, as to how and when they will finish Wickline Island, O’Brien Shoals, and West Bay. 8. Please review the updated dredging plan exhibit to familiarize yourself with the new conditions. The boat crossing shown is intended for those needing access to / from the main body of the lake from West Bay, or the west side of South Bay. 9. Lake users operating anywhere in South Bay near Highland Shores, Sunrise Ridge, Wonderview and St. Francis Heights will need to be extremely vigilant of changing conditions. The marked boat crossing will remain in the same place over the summer, but the pipeline between the crossing and the dredge will move as South Bay Dredging continues. Where feasible, avoidance of this area of the lake by lake users should be strongly considered. 10. To be safe, lake users should at no time come within 50 feet of the pipeline, booster pump, or dredge (except at the designated crossing). The designated boat crossing should be navigated at a “no-wake” speed. If necessary, the MPOA will instruct the Wonder Lake Marine Patrol to ticket any lake user operating in an unsafe manner in proximity to any of the dredging infrastructure. 12. The exhibit below shows the approximate location and extent of the sediment pipeline and pipeline crossings for the summer of 2016. As always, lake user’s need to be aware that the pipeline location will frequently shift as dredging progresses.